Deveric Mattersley has no interest in marriage. Determined to atone for his sins after convincing himself he's at fault for the death of his first wife, he decrees himself content to focus on running his family’s estates, and on raising his son–until the mysterious Mrs. James appears. Who is she? What does she want? And why does she make Dev’s blood run hot in a way no woman ever has? A wonderful, fast paced and romantic time travel tale with a twist. Who doesn't wish that they could write themselves the perfect man and then have him appear in real life to sweep you off your feet? Eliza manages to do just that with the help of her friend. She is whizzed off to Regency England after a New Year's Eve kiss from the Duke of Claremont. There are a few obstacles to overcome in their path to true love. Emily is a modern, twenty first century woman thrust into the restrictive era of the nineteenth century. On top of that, she is American and not everyone approves of the Duke's attachment to her. The Duke also has his own inner demons to face before he can embrace a future with Eliza. I will remedy as soon as possible. 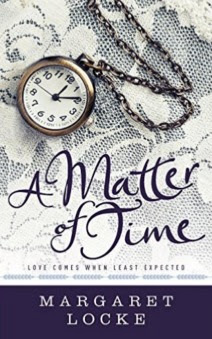 A Matter of Time is available in digital and paperback format. It is also available on Kindle Unlimited.